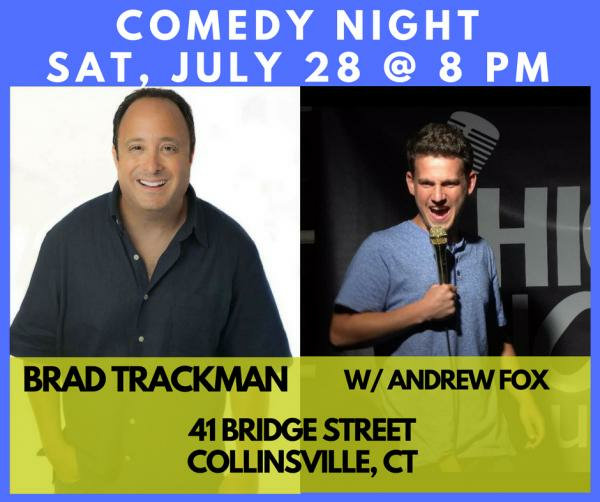 Bridge Street presents a COMEDY NIGHT featuring BRAD TRACKMAN w/ ANDREW FOX on Saturday, July 28th at 8 pm! Brad Trackman is a national-touring comedian who has been featured as a stand up on CBS's "The Late Late Show with Craig Ferguson," "Comics Unleashed with Byron Allen," "Star Search with Arsenio Hall," AXS tv's "Gotham Comedy Live," MTV's "The Buried Life," "New Joke City with Robert Klein," NBC's "Later," NBC's "Friday Night," and numerous appearances on Comedy Central. Trackman also had his own commercial campaign on Spike TV where he played the fictitious Presidential Candidate Biff Wolanski. Brad started his career in NYC and was a regular at The Comedy Cellar, Gotham, The Comic Strip Live, Carolines on Broadway and Stand Up NY. Trackman has opened for legendary comedians like Joan Rivers, Robin Williams, Dana Carvey and toured with Weird Al Yankovic. One of his most impressive appearances was headlining The Radio Shack Net Together Concert in Times Square NYC for over five thousand! He was on a Jumbotron which was also simulcast in San Francisco on a Jumbotron there too. Brad has two comedy albums of him headlining The D.C. Improv which were produced by XM Sirius comedy programmer Joel Haas. Both are critically acclaimed and available on iTunes. Andrew Fox has been performing stand-up comedy for over five years throughout New Jersey, Pennsylvania, and New York. He is the host of the comedy podcast, "The Crapulent," in which he's interviewed national headlining comedians such as, Roy Wood Jr, Ron Funches, & Jimmy Pardo. His sarcastic low key wit about his life with his family and kids is infectious.